The iTunes App Store contains thousands of puzzle applications, enough to make it a puzzle trying to find a good one. The most popular style of puzzlers for iOS involves a grid of items you must match to remove. Cell Bound by Hothead deviates from the norm by creating a circular game board. In the center of the board, you have a circle with your level number. Random colored spheres appear in the peripheral area and are sucked towards the center circle. Your job is to spin the circle using your finger to get similar colors to touch. When five spheres of the same color touch, they vanish from the board. As your turn continues, the colored spheres appear faster making the game more difficult. The graphics created for Cell Bound are stunning with a simplistic feel but very beautiful. The colors are vibrant with a retina display on the iPhone and iPod touch. The background music creates a soothing atmosphere that doesn’t make you feel rushed or forced into action. Cell Bound plays in landscape mode. When you open the program, an advertisement displays to play the Universal Movie Tycoon. You easily close this out by pressing the “Cancel” button. The main screen shows the high scores by a scrolling banner along the button. There is a button to play, a settings button and a Game-Center button. Tap the “Play” button to begin. 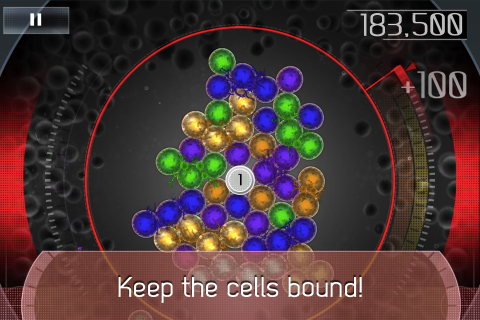 There are three modes in Cell Bound: Infinite, Burst and Timer. Infinite mode is the basic level. 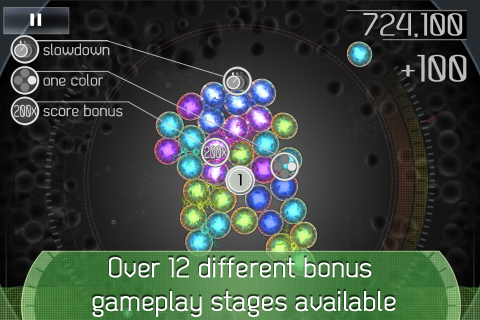 You simply play Cell Bound until your colored spheres touch the perimeter of the circle. Once that happens, the turn is over. Burst mode lets you create large groups of similar colors. When a color that does not match attaches to the other colors attaches it becomes inert and no longer bursts. Tap the center sphere to burst spheres of five or more colors. Timer mode is the same as Infinite mode except you have a timer that rushes you to earn as many points as possible before the timer runs out. The Settings screen comes with four options: sound, help, colors and hotheads. The Sound button turns off the music and sound effects. The Help button provides instructions on how to play Cell Bound. Colors lets you change the colors used to create your molecule. The Hotheads button is the credits for the application development. I would highly recommend playing Cell Bound. I thoroughly enjoyed playing and will keep this iPhone app on my phone. With the lone exception of the advertisement upon opening Cell Bound, I didn’t have any complaints about this program. It is a great combination of brilliant graphics, soothing music and entertainment for the low price of $0.99 USD. We used an iPhone 4 running iOS 5.0.1 firmware to review Cell Bound. 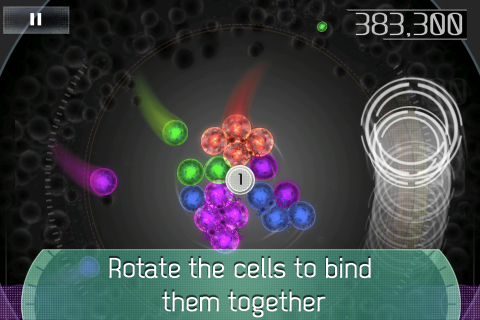 AppSafari review of Cell Bound was written by Joe Seifi on April 9th, 2012 and categorized under App Store, Arcade, Games, Puzzler. Page viewed 3799 times, 1 so far today. Need help on using these apps? Please read the Help Page.